Set in a Grade-II listed Georgian townhouse, Tonkin Liu's studio has been extended. Designed and built by the practice, an innovative timber roof and reflecting pool gathers the bouncing rain, to make it a good place to be on a bad day. 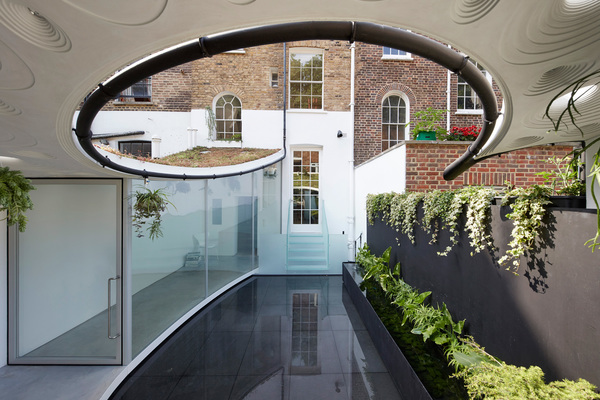 The Sun Rain Rooms is a two-storey extension and restoration of a Grade-II Listed Georgian townhouse. 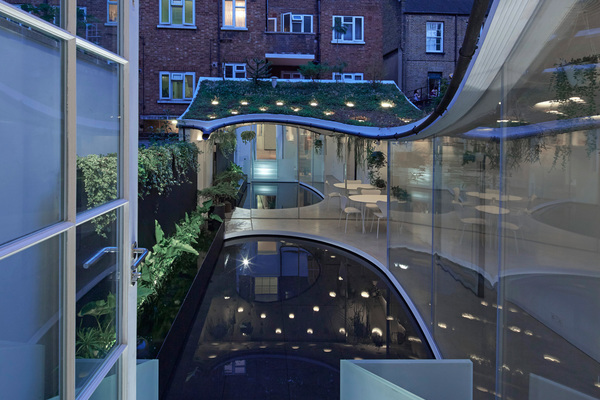 The extension reframes the rear of the building by amplifying the characteristics found within its fabric. Designed and constructed by Tonkin Liu in collaboration with local craftspeople, it serves as both a studio for the practice and a home for the partners’ family. The perimeter walls of the rear courtyard support a plywood roof, curved in plan and section to allow maximum light into a patio garden. 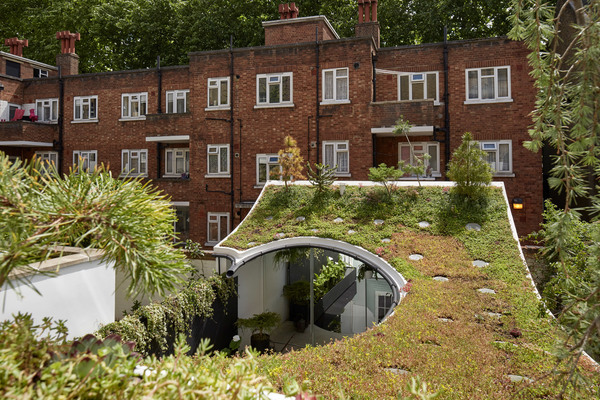 Rainwater gathered at the top of the townhouse falls through a pipe, following the roof’s curving leading edge to a spout over a long rainwater harvesting tank. 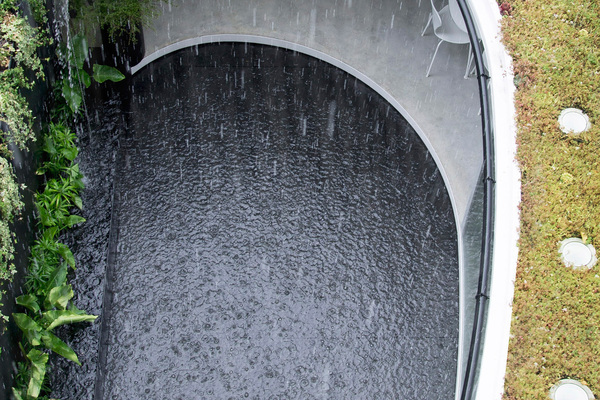 The tank floods the patio at the push of a button, transforming it into a reflecting pool. The roof’s thin 110mm structural shell is an insulated stressed-skin, joined by round coffered skylights that echo the wave pattern of raindrops landing in the pool. The extension accommodates both prosaic and poetic aspects of domestic and studio rituals. Under the roof, a garden room offers a living space for the home and a meeting space for the studio. A mirrored wall in the covered outdoor area beyond conceals a workshop, cooking area, potting shed, storage, and deep planter for the small trees in the green roof above. 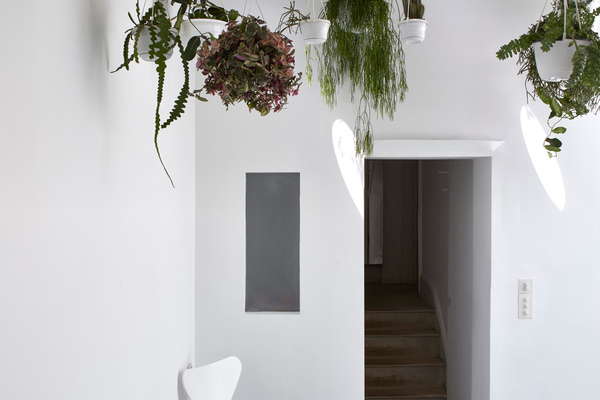 Below the patio, the existing basement has been extended to create a bedroom, two bathrooms and an enlarged, plant-filled light well.